Grenada recovered from a 3 for 8 start and six batsmen combining to produce a paltry nine runs, by using a 56 run partnership to kick hosts Roadtown Wholesale out of the Flow-Peter Haycraft Twenty 20 Cricket Cup, following a two wickets victory on Sunday in Greenland. Sent to the crease by Grenada after losing the toss, Roadtown Wholesale recovered from 4 for 50 to post a formidable 149, with opener Sylvester Mitchell getting 36, before he became one of Gary Prince’s 4 for 42 haul. Austin McDowall, who carried the team over the last few years but struggled to reach one half century this season, was caught for 31, while Trent Belfon broke Murray Ollivierre’s bails for 30. Grenada overcame their 5 for 27 start when captain Derol Redhead and Irwin Lewis put on a 56 run partnership for the ninth wicket to take them to victory. Redhead had a not out 53 while Lewis finished on 26 not out. Ronalie Caines was Roadtown Wholesale’s most effective bowler, bagging 3 for 21. Redhead, who is also captain of the Sugar Boys football club and came down from Virgin Gorda, said they knowing that a victory would get them to the second round, therefore, it was an important game. 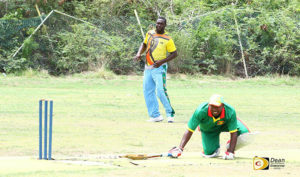 Despite their belief, six of Grenada’s batsmen combined for nine runs including two ducks. In the second game, Ground Works’ bowlers disarmed Under The Tree’s batsmen, six of whom had five runs or less including four ducks, chasing their 149 for 2 total, that was constructed on a foundation laid by Mark Gonsalves (54) and Mohammed Hussen (44). Both finished not out. Under The Tree’s anemic batting saw nine batsmen scoring 12 runs or less. Only Kenrick Leslie’s 36 not out, put up any resistance in their 101 total. Ground Works’ Ian Smith ripped through the order with 3 for 11. Rogel Noel plucked 2 for 23, but helped pad Under The Tree’s tally with 15 wides.